can we go back to a text based schedule? The original text based post is on this thread, so yes we can. What might be better, is to have the excel file behind the image attached so that can be edited and attached...because editing that text file is also a pain. I am also still very open to any other approaches that make it easier! Is there anything to add besides Australian Bago at the moment? I do plan to do that, this weekend should be fine. ggrr....Fibsboard needs to get with the times!! and whyyyyy soooo agonisingly slow, does it need a reboot or kick up the 'erse or something?? May I suggest the tourney schedule be reflective of UTC time exclusively since that is a world standard time? While USA/EST may be easy for me since I live in the USA, I have no idea what Aus/Eastern represents. My suggested World Clock Meeting Planner has no basis for Aus/Eastern unless I know of a city in that time zone, which I don't. Using UTC seems infinitely more simple than looking at a chart with multiple time bases. May I suggest that the tourney schedule only reflects UTC if the actual tourneys themselves run on it. If not, the schedule will need updating every time there is a time change in any host country. It's difficult enough following tourney times when local clocks change without the schedule going ballistic as well. I also added a notice to the tourneybot 'tourneys' command that tells you how soon the next tourney opens, so no time zone needed! Thanks for that Tom. Now even I can sound intelligent when someone asks me when the next tourney opens. Much easier to be able to tell them how many minutes till registration opens than to try and work out times in different zones of the world. These changes are just updating the schedule to the way the bot creates the tourneys and nothing else. Socksey should be listed FIRST on the F3 and Saturday Mini's! 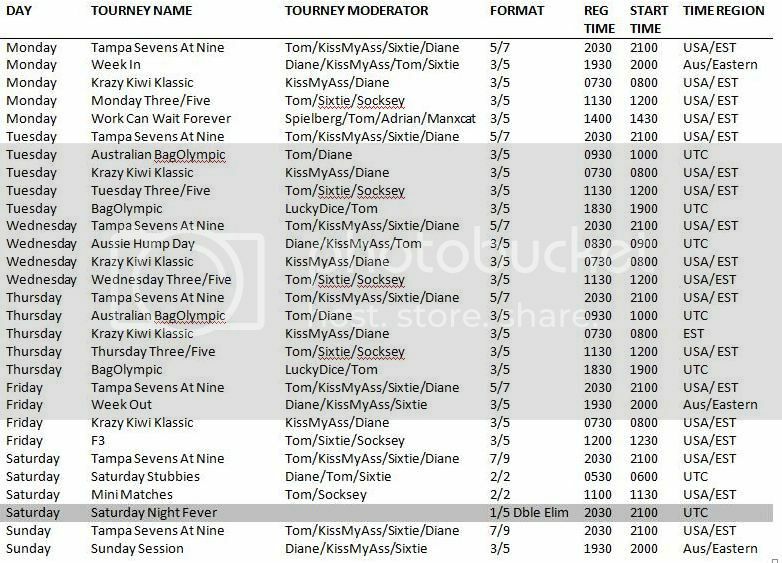 Ok, is it possible to do an export from the bot?o...ooo, deja vu...anyway, rather than me asking the bot about each tourney individually, can you get a listing of who TDs what? If you want to tinker any others before passing me the list, do that. You can email it if you like. Once I have the real status, will tinker this to correct and post again. I'm co on Konkluder cos it was set up for me to help Cigale find his TD feet. If he decides later on that he wants that spot to name his own tourney, then KKKK will be no more and Cigale will have the slot for whatever he comes up with. Entirely up to Cigale to decide things about that tourney. I like that! But, another mystery. Why do some of the tourneys in progress notify me when I log on and some don't. I like the easy way to not have to find the tourney number manually or wait for the announcement. I'm a busy lady! I have my phone alarm to keep me up on when to start, so I can manage my time better. Also, I'm getting lazy. It's not a tourney in PROGRESS it is if the tourney is accepting registration! That is a mystery indeed - I had meant to raise that one. Tampa always tells me it is open for registration, as does Krazy..but a good few others don't [my own, for example]. Is it a setting rolled out to some tourneys but not all yet? No, it should work the same for all. If you are a SUBSCRIBED player and login while registration is open and you are not registered the bot will tell you. Page created in 0.301 seconds with 57 queries.